Ice cream falls in the top 5 of favorite desserts (the classic chocolate chip cookie being my first love). I love it even more because it’s something I can get really creative with when I make it at home. The invention of unique flavors is the fun part, but the mastery of that creamy and perfectly icy free texture is the hard part. I tried using stabilizers, but it resulted in a gummy artificial mess. I’ve concluded that ice cream made using liquid nitrogen results in the most perfect texture. It’s inarguably dense, creamy, and smooth. Rapidly churning and freezing the liquid ice cream base minimizes the introduction of air and the formation of ice crystals. These liquid nitrogen ice cream places have been picking up in popularity, in spite of the higher price, $4-5 for a single scoop on average. I’ve been meaning to try Cauldron since it’s right next to Ritter’s, which I visit from time to time. I’m sure they get a lot of their customers looking for something to sweeten up their palate after a bowl of Ritter’s famous panroast. 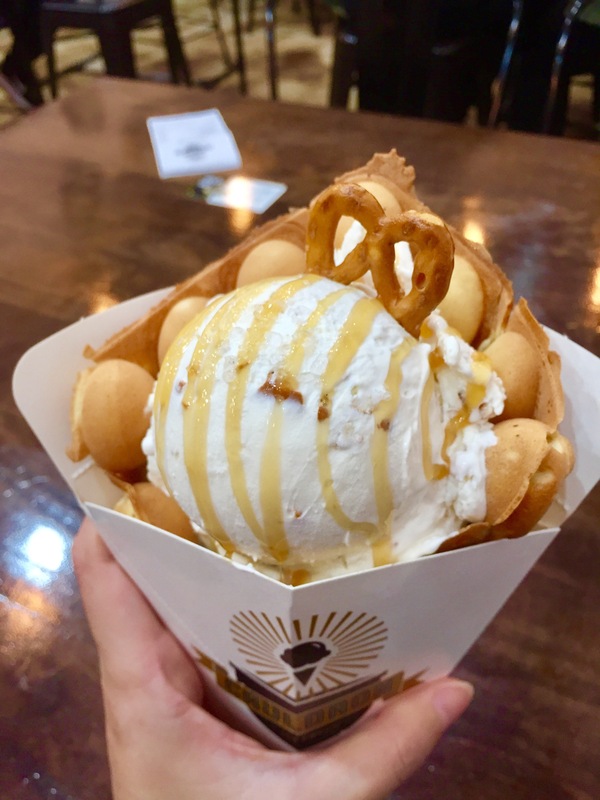 What sets Cauldron apart from the other liquid nitrogen ice cream shops is their special waffle cone. 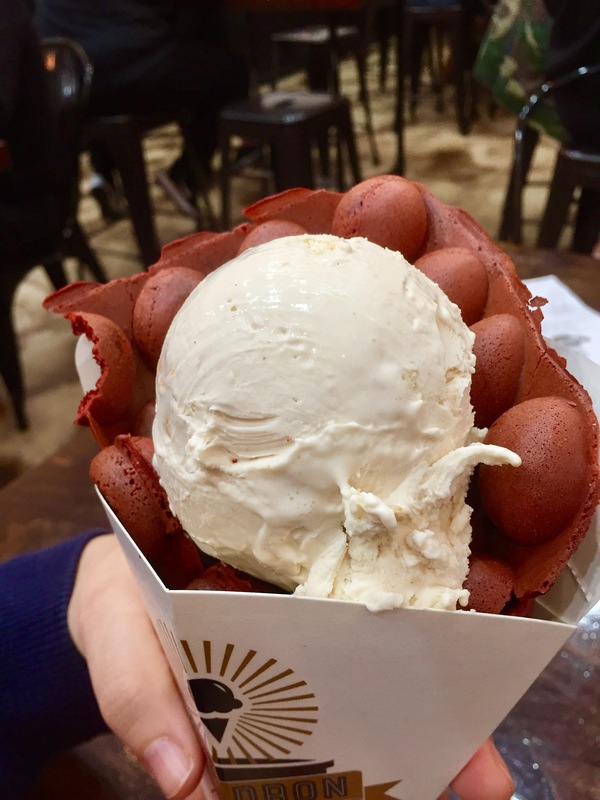 They’ve taken the classic Hong Kong egg waffle and made it into a cook. Another food mashup gimmick? Sea Salted Caramel Crunch caramel ice cream, pretzel bits, sea salt. The texture of the ice cream was perfect, 10 out of 10. The flavor of the ice cream was rather mild. The extra salty caramel sauce drizzle on top helped bring some more oomph. I enjoyed the crunch of the pretzel bits throughout. The egg puffle was fresh, soft but a little chewy, and just the right amount of sweetness. It actually worked very nicely as an edible medium to hold a scoop of ice cream. The texture was perfect, but the cookie butter flavor was lacking. The red velvet puffle was nice. The chocolate notes were very subtle. We were so intrigued by the name. Not sure how that name relates to a combination oolong, jasmine, and green tea ice cream. The earthy tea flavors were really light. It was a beautiful creation nonetheless. Cauldron delivered ice cream that was thick, smooth, and creamy. Just the way I like it. Not a single ice cream crystal could be found in the whole scoop. I have to ding them on the mildness of their ice cream flavors. Sometimes it’s not obvious what flavor you’re eating. Their puffle cones are not just a gimmick. They add notable value in taste and creativity. Eating the whole thing, puffle cone and ice cream is so much more than one person should consume so don’t be afraid to share. There’s more than enough calories to go around. If only I could use liquid nitrogen to make my ice cream at home. 10 – You NEED to eat here.